According to a study published in the Obesity Research and Clinical Practice journal, it is possible to train your willpower in the same way you would train your body to build more muscle. Researchers at the The Miriam Hospital's Weight Control and Diabetes Research Center also found that those who were able to build their self-control were also able to lose more weight. Heyo! Lead author, Tricia Leahey states that, "the more you 'exercise' [your willpower] by eating a low fat diet, working out even when you don't feel like it, and going to group meetings when you'd rather stay home, the more you'll increase and strengthen your self-control 'muscle' and quite possibly lose more weight and improve your health." Will it be easy to train that self-control muscle. Absolutely not. Just think about anyone, anywhere who has accomplished something great - setting a PR, building a company from the ground up, learning a new language, etc. They will all tell you the same thing - success takes a heck of a lot of hard work and determination. Alwyn Crossgrove, one of the head honchos in the health and fitness industry (I had the pleasure of meeting him at the Perform Better conference this past year - he's great) makes a good point when he says, "If you're not consistently carrying out your plan 90% of the time you really don't have a plan at all." Ouch. If that isn't a hard truth I don't know what is. Set An Ambitious Goal - it shouldn't be impossible but you also shouldn't undershoot. Don't wait for yourself to exceed your own expectations, set the bar high so that you make it happen! Be Specific - According to Halvorson, intentions fail 75% of the time. We need to break our goals down into small, manageable steps so that intention becomes action. Simply stating I'm going to eat healthier this week is a sucky goal. Instead, make a plan stating that you will go grocery shopping on Saturday, prepare your meals on Sunday and eat at least 3 servings of vegetables Monday-Friday. Reward Your Successes - who doesn't love winning prize!? A reward has the power to double your self-control. When we are rewarded our behavior is reinforced (e.g. when a baby cries - the mother picks him up and gives him attention - his crying is reinforced and therefore, in the future, when the baby is in need of attention - he cries). Thank you Psychology 101! So, pick a milestone and choose a reward to bestow upon yourself if you accomplish it. I'd highly recommend a non-food related reward. Going to a concert or allowing yourself to buy those new sneakers you've been eyeing, whatever it may be. Fuel your Self-Control - this is one of my favorites. Have you ever worked out without eating for an extended period of time? It's not a good situation. You feel noodly, tired and very lethargic. Well…turns out your self-control isn't an exception to that rule, he needs food too! Research shows that willpower weakens significantly when our blood sugar is low. So keep food in the tank in order to make healthy, logical decisions. Be Wary Of Overuse - as with all other muscles, too much use can result in wear and tear. The same goes for self-control. If you're trying to accomplish too many things at once chances are you won't be able to commit enough to any of those goals in order to succeed. Let's say you're trying to train for a half marathon, you're working on a big proposal for work, and you're getting ready to welcome a new baby into the family at home…each of those things individually demands a lot of self control. when you put them all together, somethings gotta give! Don't strain that muscle - put something on the back burner until you can devote more brain power to it. Mastery > Performance - Studies show that when we stop trying to be good and start trying to get better we not only do better, but work harder and persist longer. And persistence and hard work, Halvorson says, have a lot more to do with success than innate ability. So let's stop trying to be good and start trying to be better. 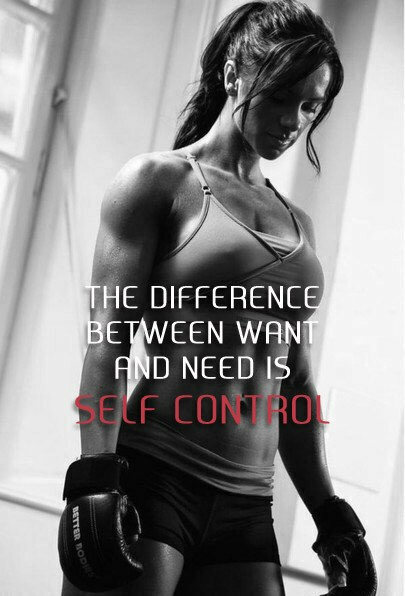 How will you exercise your self-control today? This week?